London based, Vancouver born Jack Duckworth (yes I’m thinking of Coronation Street too) brings us his second album as Synth/New Wave act, Soft Riot’. Everything is as one would expect; throbbing electronic bass, drum machine sounds and weirdly gliding synthesizers whilst he croons deeply over the top. A full plethora of influences are utilised from his chosen era and yes there’s more than a touch of Gary Numan musically, along a whole host of artists I can’t be bothered listing. I have an issue with the validity of a release such as this, that and the fact that as a project, whilst being as inoffensive as ‘Fiction prediction’ is, isn’t really that well done. Part of me wanted to get long with Soft Riot and I suppose that’s because I have no issue with people trying to revive the past. If this is to be attempted though, then it truly has to be something spectacular and Duckworth simply isn’t up to the task, other than subscribing to cabaret electronic nights or working class wedding singing. 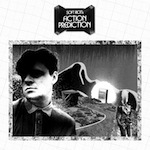 ‘Fiction Prediction’ as a whole just feels lifeless and droll, lacking emotion and drive.